A few years ago, I fell in love with a muffin that inspired these Skinny Chocolate Chip Muffins. It was served at a conference I attended, but wasn’t a skinny or lower calorie option at all. It was sweet, moist, and delicious. Making these was an effort in trial and error. 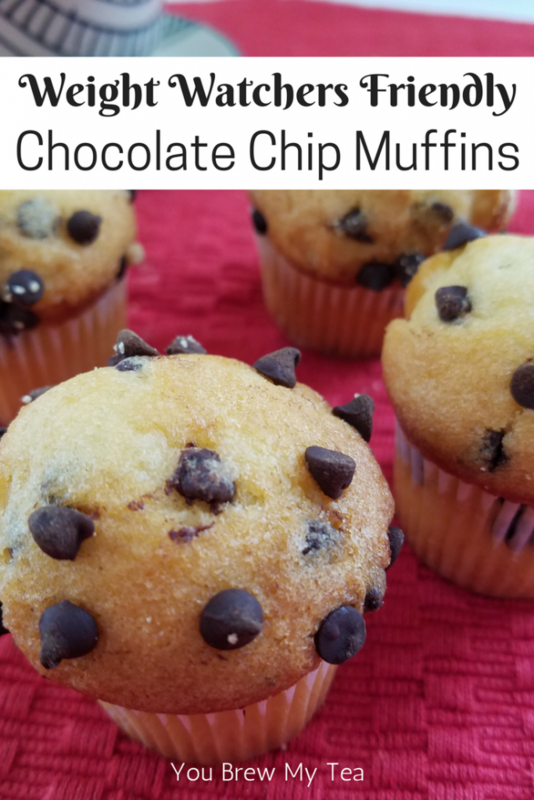 We finally found a great base muffin batter and decided to add the chocolate chips on top right as we pulled out of the oven works perfectly! This post may contain affiliate links. I will earn a small commission on purchases made via these links. There is no need for fancy or odd ingredients to make these skinny chocolate chip muffins. Just a few basic items you likely already have in your pantry. I find that this kind of recipe really is the best kind. I love having something like this for breakfast, or a sweet after dinner treat. With lower points, they easily fit into the realm of Weight Watchers recipe needs. In a large bowl, blend together the flour, sugar, salt, and baking powder. In a medium bowl, mix together the almond milk, applesauce, eggs, and vanilla extract. Pour the wet ingredients into the dry ingredients and blend until just incorporated. You want all dry ingredients to be wet, but don’t over blend or you will have a heavy/dense muffin. Fill each muffin tin 3/4 way full and top with approximately 7-10 mini chocolate chips. Bake at 425 degrees for 7-10 minutes or until a toothpick inserted in the center comes out clean. Pour the wet ingredients into the dry ingredients and blend until just incorporated. You want all dry ingredients to be wet, but don't over blend or you will have a heavy/dense muffin. Fill each muffin tin ¾ way full and top with approximately 7-10 mini chocolate chips. As you can see, these skinny chocolate chip muffins are a great addition to your meal plan. They are low in points for a bite-sized treat and are satisfying if you are craving chocolate. We make them and store in gallon freezer bags in the freezer to pop out and reheat in the microwave when we want one for a snack. That way I’m not tempted to overeat them!